The 26 gauge corrugated door curtain is manufactured from full hard galvanized grade 80 steel and coated with Super Durable polyester paint that is backed by a 40 year film integrity and 25 year no-fade limited paint warranty. Independently tested in accordance with ASTM-330, the series 3100 meets requirements of Standard Building Code, International Building Code and Florida Building Code. Design wind load is rated +36 PSF and -41 PSF for opening widths through 12�0� and +35 PSF d in over 20 different standard colors. 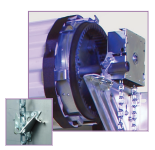 The header seal attaches directly to the header and extends up to 5" to the door curtain to form an effective barrier from environmental elements. 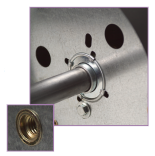 The top draft stop mounted to the door curtain provides a 2-1/4" weather seal between the door and the header. Universal mount 4" deep 11 gauge galvanized steel wind bar guides require no Pre-installation modifications for steel, concrete or filled masonry block applications. 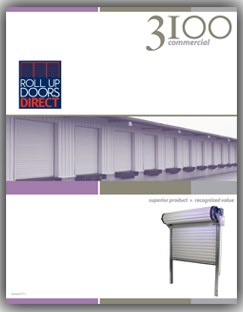 Roll Up Door 8'-00 wide 8'-00 high Model 3100.